It was the summer of 86. I had just graduated high school and was off to UC Santa Barbara in the fall. Most of my friends were backpacking across Europe or taking hedonistic cruises to Mexico as their graduation gift. “You’ll get a gift when you graduate college,” Dad stated. My over-protective parents weren’t about to let me wander off overseas, so I took a full-time job locally with Western Temp Agency. From the get go, they loved me. I didn’t realize how easy it was getting a job if you had the least bit of common sense and typing skills. Vicki and Patti were the two ladies that ran the small office that summer. They told me stories of the applicants they’d get, lying about their skills. “One guy lied about every job on his resume, it was unbelievable,” Patti told me. “He even had fake references, did he not think I would check them?” She was clearly insulted by the imposter temp. I became their temp mule. Whenever they got a big job, they sent me in, like the cleaner. I worked across the San Fernando Valley as a secretary, getting job offers at most places I pranced through. One day, after a long haul of Xeroxing at my Blue Cross gig, Patti called me to tell me that they landed a new client, Costco. “We need you to go out there tomorrow and sell Almond Roca for the day.” Sell Almond Roca? That was the stuff my old relatives in Jersey kept in candy dishes. I had just settled into Blue Cross with the other secretaries. It reminded me of the movie 9 to 5. I was sad for the secretary pool, as they were called. For me, it was a fun summer job, for them it was a career. I had never been to a Costco before, and in, Oh my Gawd, the Valley. I was a bit of a privileged snob during that era, and discount shopping was taboo. This was going to be worst job ever. I drove to the Costco in Northridge the next morning. I arrived early and sat in the parking lot in my car, drinking Diet Coke and listening to KROQ. I was supposed to meet the Almond Roca representative to do the transfer of goods with instructions. I had no idea who I was looking for until she showed up. Pink Almond Roca shirt, pink Almond Roca hat. No way. If anyone sees me here that I know, I’ll die, I thought to myself. We walked together inside and setup a small plastic table and chair in the large candy isle. It was only 8:30am, but was already hot outside. The valley was a scorcher in the summer. The nice representative gave me quick instructions on how to pass out candy. It was like being trained for Halloween. “Only one piece at a time please,” she instructed me. And just like that, she was off to intercept another temp at another Costco in the Valley. Suddenly I was terrified. Costco was so uncivilized — kids running around, parents screaming. It was a ginormous warehouse with doctor’s office lighting. I parked myself at my pop-up Almond Roca station in the candy isle, laid some merchandise down on a serving tray, rubber gloves on, and waited in anticipation. I felt incredibly uncool and cursed my classmates gallivanting around the globe. I will die if anyone I know sees me here. As customers began trickling in, I took a good look at the Almond Roca morsels. At first I couldn’t quite place it, but then YES, the resemblance was astonishing. How could I not have seen this before? My parents had a German Shepherd named Trooper. He was more or less a K-9 reject. Trooper loved their cat Molly. But what he loved even more was digging through her litter box for those delectable litter-coated cat terds. I called it kitty candy, and it was a delicacy for Trooper. He’d walk around, chewing the kitty candy as it made my mom dry heave. “Oh Trooper” she pleaded. You could hear the litter crunching, just like a hard candy. He had litter stuck to his chops and a huge grin. He was so happy that after he was done, he’d run up to you and try to lick your face. That’s when you ran fast, real fast. Back at Costco, I sat in the candy isle, passing out Almond Roca to customers, pretending it was kitty candy. It made the day go by quickly and frankly more enjoyable. I gave the customers more than one if they wanted. “Two for one?” I’d say. It was like watching Bill Murray in Caddyshack when he ate the Babe Ruth in the pool. The Costco customers were very pleasant. Some brought me ice cold drinks and one offered to buy me lunch. They were concerned for my welfare. “You poor thing, standing here alone all day.” I was having a ball, making friends left and right. “You must be eating mouthfuls of candy sitting in front of it, my dear,” a nice elderly woman asked me. “Why no, I haven’t touched it actually.” I’ll be honest; in the beginning it was tempting. I love butter crunch toffee just as much as the next person. But seeing it laid out by the palettes in Costco made it seem less appetizing, coupled with my kitty candy back flashes. The day was coming to an end; I was sad. The pink Almond Roca rep came in to relieve me and help clean up. “Wow, you went through a lot of candy today,” she noticed. “I know, the place was packed,” I assured her. We walked out of Costco together, she thanked me and gave me my own can of Almond Roca, “thanks so much,” I said on behalf of Western Temp Agency. I drove home, parked myself on the couch in front of the TV, and proceeded to eat the whole can. I was possessed, I didn’t know what happened. I think I devoured it based on entitlement — Almond Roca owed me. My feet hurt. 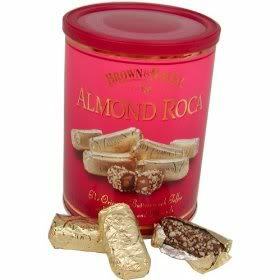 I haven’t eaten an Almond Roca since then, but I do now love Costco and other discount stores. Poor Trooper died years later of an anxiety medication overdose. But the family still reminisces about his fondness for kitty candy. This is hilarious! Keep it up. I want more stories from the valley!